If you’ve become accustomed to enjoying your holidays in swanky hotels with room service and a pool, the notion of ditching premium accommodation for self-catered tents and motorhomes might seem like more of a nightmare than a vacation. However, glamping is a happy medium between the hotel and the traditional tent – and it’s something you ought to consider trying out. Firstly, stop thinking bugs, mud, and peeing in the bushes. Glamping is nothing like your old camping trips with scouts. Glamping is about electric hook-ups which mean you can bring along your hairdryer, your curlers and your kettle. It leans more towards log cabins with cosy bedroom coves than it does to sleeping bags on the bumpy ground. 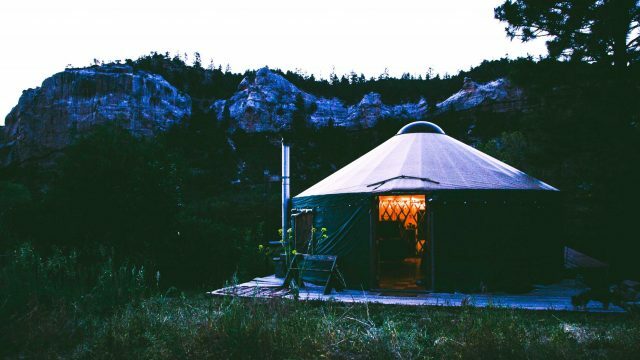 Glamping is not just a way to reign in the purse strings when planning your family trip, some glamping sites might cost more than your average hotel. So why would you bother? One of the biggest perks of glamping is the chance the have your very own unit, no unwelcome noises coming from the walls of the guest next door. No awkward encounters in the lift. No wishing the kids staying in the room across the hall from yours would stop trying to convince your children to dip out of family time with them. That’s not all that makes it worth your while though. You can make what you want of the experience. With most hotels nowadays, especially with all-inclusive packages, we find ourselves going through the motions in the same pattern as every other family. Wake up, go to breakfast, sit by the pool, go on the excursion organised by the site, come back, watch the show at the bar, have a few drinks, go back to the room, and repeat. Often the greatest excitement is one of your family being dragged on stage and subsequently embarrassed by the substandard night-time entertainer. Do you ever think that maybe your break could be better? That you could plan to see what the locals love to do regularly or go explore without a tour guide? Glamping gives you the opportunity to plan your own time on your terms. That’s not to say you’ll find yourself strapped for things to do. Most glamping sites will have a reception that’ll be glad to advise you on what’s going on in the area and what you might find interesting to visit, but above all the locals will be your guide to the location’s best kept secrets and must-see spots. You’ll be amazed by what you can experience and share with your loved ones while you stay in real comfort. Try out a glamping stay, and I guarantee your holiday tales won’t ever be the same again.